The weather was awful, with humid smog filling the city and lowering visibility to only a few hundred metres. The international media seized on this and worried officials advertised an emergency plan to take 90% of all private vehicles off the road if conditions didn’t improve by 48 hours before the opening ceremony (thankfully, this didn’t happen). The media also wrote about traffic delays due to inspections introduced a week earlier. I actually found the inspections less tedious than when first introduced – time in line down from 1 hour to 10 minutes. Still, my passport was checked every time I entered the area I live in, and twice on the way into Beijing. Large banners were hung on almost every overpass (in a city where roads bridge over one another sometimes 3 levels high, this was impressive). Olympic sculptures began to appear, in metal and wood and, most noticeably, in flowers. New security measures required by the government began – at CHURCH! Entering the theatre for the following three Sunday required not only showing a foreign passport, but leaving all liquids and large bags outside, and being swept with a metal-detector wand. The payoff was a BEAUTIFUL summer Sunday – clear skies dominated by a bright sun that was HOT at 9am and BLAZING by 10:30. Finally, the Chinese Olympic uniforms were unveiled – to instant internet derision. What can I say? Ewwww!! Watching in a large group was fantastic – we would applaud the best parts of the ceremony, and when the teams came out we cheered for countries we were from, countries our friends were from, and countries we had some vague connection to. It was fantastic! My favourite parts were the opening drummers, the character “tiles”, the athletes walking across the painting and, of course, the awesome torch lighting segment!! The night was far from over when the coverage ended. The streets, which had been DEAD for four hours, sprang to life. There were far fewer cars than normal, but far more pedestrians than you would normally see, even in the middle of the day! People spilled from their places in front of TV screens and flooded the streets looking for a way home. We walked the 500m or so to the nearest subway station (my first time to ride the newly opened line 10) and went two stops west, figuring that if we weren’t going to be able to find a cab, we might as well start from the closest subway stop to our destination. We were saved a 30-45 minute walk as there were several taxis arriving with passengers headed into the subway as we were coming out. Due to fun visa issues, I visited the Jiangtai paichusuo (local police station) A LOT during the whole Olympics period. They were CRAZY busy a week before the opening, and during week one. It was full of tourists (both international and domestic) and groups of athletes sitting around waiting for Chinese agents to get them registered. By week two the place was dead. I watched a little of the Games on TV – there was live and recorded coverage on AT LEAST 4 channels. My last event was the final of the womens’ teams gymnastics. All we saw were China and USA (because they were paired together). Even when no one from either team was competing, we watched them sit around, or stretch, or chat. I didn’t even see a blurry, in-the-background glimpse of an Australian uniform! Despite this, various local I spoke to during the Games (lots of taxi drivers, mostly!) all knew that Australia does well in swimming! Several asked about Thorpe, and why they hadn’t heard anything about him lately. At work I posted the current medal tally each day at lunch, and by the end of the week we were having ineteresting discussion about it all – about how well Australia does for a small country, confusion over why Russia wasn’t in the tally (they didn’t appear in the top 5 until late in the final week), and debate over whether China would hold onto their lead. I was saying months ago that China would top the tally comfortably, and I was honestly stunned by how few locals shared my opinion. By week two I was a litle sad that I hadn’t really made an effort to do anything Olympic. Yes, I’d visited the Water Cube and Baseball stadium in the lead up to the Games, but with the move to Langfang and my general disinterest in all things hyped, I hadn’t done anything else. If I’d been in the city I probably would have ended up going along with people, but I wasn’t and I hadn’t and although I wasn’t upset I was starting to regret not making more of an effort. Then my boss announced that the office staff would all go to a morning session of track&field at the Birds’ Nest! We left early, as humid drizzle started to fall. By the time we arrived in Beijing it was raining cats and dogs! The 6 of us had one umbrella and one raincoat between us… needless to say, we got SOAKED. But it was still fun! We sat high in the nosebleed section and dripped on the seats – thankful to be out of the rain. We saw the end of the womens’ 20km walk, heats of womens high jump, and four events of the mens’ decathlon (100m, javelin, long jump, shot put). The high jump and javelin were really interesting! All in all it was a great day, and I thoroughly enjoyed going – even if my leather bag was still wet the next morning! At 8pm we gave up and decided to go to Solana for food, icecream, and big screen coverage. We got in a cab a minute before the opening fireworks, and our driver drove along the 4th ring at a snail’s pace while all four of us (him included) watched them. We settled on the steps at Solana as the last few teams marched out. The sunbird was our favourite, and we cheered loudly for Han Hong (best Chinese pop star EVER!) We loved the girls in lit-up marshamllow dresses, and the arm ballet was VERY cute, but would have seemed far too long if it wasn’t set to my favourite piece of classical music – Ravel’s Bolero. We went home before it finished because I was falling asleep on Bec’s shoulder and needed to be up to lead at BICF in the morning. On the way home, Lynn told us that she had tickets to wheelchair rugby, and asked if we’d like to go. I said and excited YES immediately as a friend had been talking about the documentary “Murderball” and I was intrigued. Then Lynn mentioned that her tickets were for a session with a China match and a USA match, but that the session after had Australia vs New Zealand. So when I got home that weekend (while/after talking to Daddy for Fathers’ Day) I went online and bought tickets! Then I realised tickets were cheap and thought I’d see what was available on Sunday afternoon – and got seated volleyball tickets, the womens’ medal matches and ceremony. Within half an hour I had friends to go with (I bought 5 for each event) and was very excited about it all! In addition to my new purchases, I was also looking forward to seeing wheelchair tennis on the Thursday. Our whole company went together, and it was a great day! The weather was BEAUTIFUL! The sky was blue and almost completely clear – it was bright and sunny and hot without being humid. We wandered the Olympic green a little, had McDonalds for lunch (imagine buying 25 lunches! twas fun!) and then went to the tennis. We arrived at centre court just as one match ended – meaning we spent half our time waiting for the next one to begin! No matter, it was still exciting and very interesting! It was the semi-final of the quad doubles, the number one seeds (ranked 1 and 2) from USA against a team from the Netherlands (ranked 5th and 9th). The Dutch team was a 28 yo guy, and a 53 yo woman with no legs and no fingers! She was AMAZING, too! We saw most of the first set before setting off, finally getting back around 7pm. It was a fun, full day! 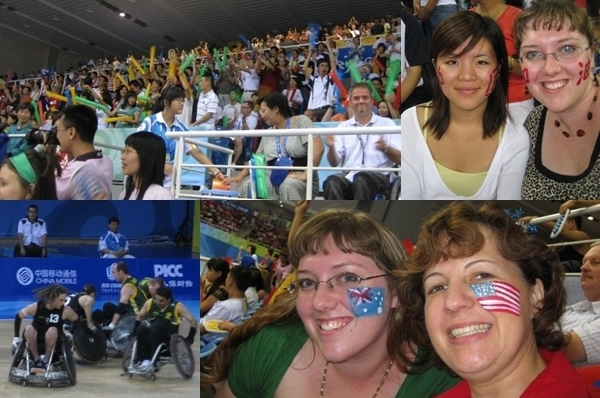 I went to FOUR wheelchair rugby games on the Saturday. It was FANTASTIC! Seriously, my new favourite sport. I saw the first two games with a group of 10 people (some American, some Chinese, myself and a pom). We sat in the first two rows, to one side of the court. We saw China get soundly beaten by Canada, despite some extremely one sided cheering, and then saw the USA vs Japan – a fabulous game which made the sport look more like team dodgem cars (bumper cars) with a ball. USA won, but it was close. The Australia/NZ game was FANTASTIC! The scores were tight the whole way through, and in the fourth quarter the kiwis were up by one – until a goal to Australia 20 seconds from the finish put the score at 38 all. We were expecting overtime, but then Batt (aka THE MACHINE, as we dubbed him) sneaked across in the VERY LAST SECOND!!!! And the crowd went WILD!!!! Sunday afternoon brought the finals of the Womens Seated Volleyball. First up was the bronze medal match – the Netherlands vs Slovenia. There was a big and bright orange section of crazy Dutch fans, but toward the end of the match they were drowned out by the loud cheering for Slovenia coming from the Chinese fans. The Netherlands still won convincingly in straight sets. Next up was the gold medal match – USA vs reigning champs China!!! A friend and I drew 加油中国 (Go China!) on our cheeks with red lipstick. Well, I was 加油 and she was中国. The Chinese fans around us couldn’t get over it! A few photos were taken with us before we settled in to watch the match. I can’t even describe the atmosphere! It was amazing. Every time out the whole crowd would stand as one, clapping and dancing to the inevitably bouncy music being played. We started calling them one-minute-dance-parties. When China won, well, it was insanity. But a very good insanity! Then we watched the medal ceremony, the flags raised, and the Chinese anthem played – it was amazing. I’m not going to bother – my TV isn’t working right so I’ll just get ’em all on DVD!! So that’s it! I’ve enjoyed my Olympic Experience. Hope you enjoyed the stories and photos! I tried to keep it short, and although I’m not sure I succeeded, there’s so much more I could have said!